Police and CTA personnel were on hand at the Green Line Garfield stop to assist riders. Thirty-five minutes. That’s how long it took to get from the 95th Street Red Line El stop to the Green Line’s Adams and Wabash stop in the South Loop. But it wasn't by Red Line train on this day. This morning marked day two of the Red Line’s Dan Ryan construction shutdown, the first day for rush-hour commuters. Thousands of commuters from Chicago’s South Side have had to find alternate routes around the city as improvements will be made to nine CTA stops from Cermak-Chinatown south to 95th Street. This is the biggest U.S. public transit disruption for construction since the early 1990s. The $425 million project, paid for by state and local funds, includes replacing ties, rails, drainage systems and station upgrades. Including an expansion at the 95th Street station. CTA President Forrest Claypool said it’s better to do all the repairs at once, rather than weekend shutdowns over a four-year time span. Arrived at the 95th Street station, where buses flooded the parking lot and surrounding streets. 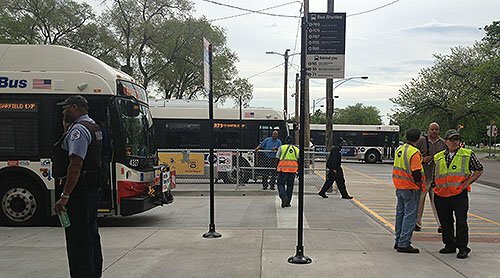 Several orange-and-yellow vest wearing CTA personnel directed the overflow of confused passengers to the correct bus. I loaded the crowded, standing-room-only R95, a free shuttle bus provided by the CTA. As we traveled north on the Dan Ryan, construction workers worked nearby on the tracks. A flustered female passenger across the aisle was venting on her cell phone, saying how she was going to be over an hour late for work. This would be the case for many passengers, but Claypool says they want to minimize the inconveniences. Enter into the Green Line’s Garfield stop, which is serving both Green Line and rerouted Red Line trains. It was a similar scene to that of 95th Street; several CTA workers, police officers and confused Chicagoans. Entry into the train stop was also free. Hopped on first arriving train, a Green Line train. Overall, it was a smooth ride, and several CTA personnel at the various stops eased the frustration of knowing where to go. It will likely take riders several days before they adjust to their new routes, but the CTA is prepared to make any needed additional changes. “We are ready to make any changes, even small ones, based on the experience of the first few days and weeks of the project,” Claypool said. Construction is expected to be completed in October, giving commuters five months to get situated with the alternate routes. Feedback: Contact the reporter via Twitter and leave a comment below. You also can submit a story idea or report an error.